This is from my walk with my two grand-daughters (4 and 6) around Bodiam Castle a couple of days ago. 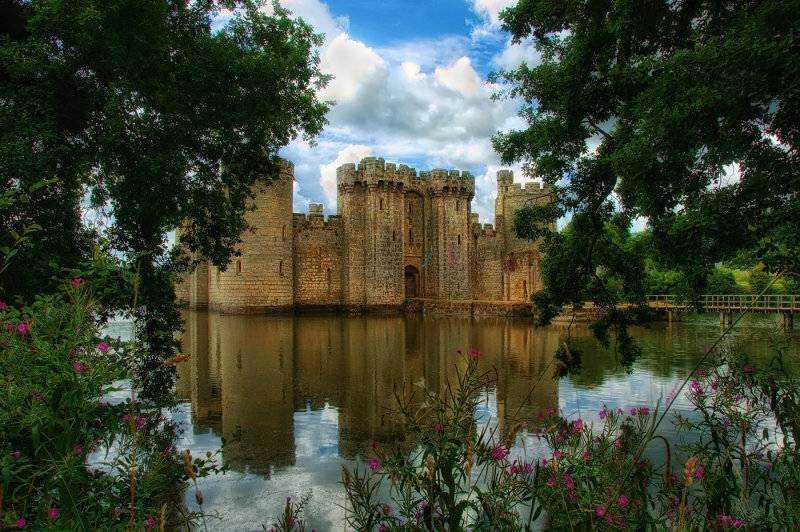 Bodiam Castle is very close to where I live and a very beautiful place to visit. An update on my son’s wedding in Gretna Green, Scotland a couple of weeks ago, all went very well and the photography was a great success. Very many thanks to Paul (Milholland) for all his help using the speedlight successfully, I am very grateful. I have hundreds of images to sift through and I can see it taking a fair bit of my time along with looking after my two grand-daughters through the week. Who said retirement was a time to sit back, feet up and chill out. Magnificent photograph of a traditional English Castle, complete with moat. Superb composition and like the reflections also. Excellent picture of this wonderful castle, all it needs is a damsel, a dragon and whole lot of knights on horseback. Splendid image, Anne, with excellent framing. Oh, Annie Girl,...This takes my breath away! Please teach me! A superb image, great reflections. Probably a place that can inspire writers.Very well shot and presented. I can imagine the princess held prisoner in a tower, the dragon guarding things beyond the moat, and three armored knights inside the castle walls. A superb image of this fine place. V.